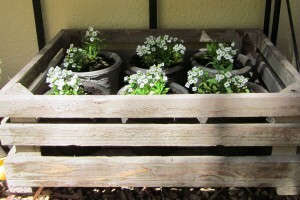 Just before Christmas, Stefani (my daughter for those who don’t know) talked me into buying this crate with the little pots in it for the garden. It’s been sitting around for a month now “waiting” for me to plant something in the pots. I was going to plant herbs in it, but then decided it would look pretty straight away with something that’s flowering, so yesterday I planted some of the Alyssum seedlings that were meant for a border into the pots. And I think it looks cute! What I love about gardening is that things are always changing and can be changed. If a plant is not thriving somewhere it can be moved to a better position. If a patch is not enchanting, one can add to it, subtract from it, move things around, heck, maybe even add a garden gnome for effect! (I don’t have any yet but I do have a metal frog!). And whilst there is so much for me to learn about plants and taking good care of then to get them to thrive, gardening allows me to be a bit creative with colour and form. Wow, so you finally got something in that gorgeous crate with those cute little pots. I love what you’ve done. This looks amazing – simple and very effective! You are so right about being creative and also how change can sometimes make all the difference!! It sometimes takes something small to bring about a big difference.